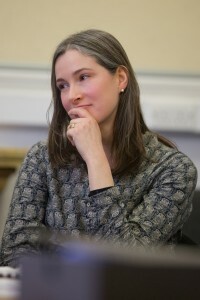 Emma teaches across all of the Centre’s professional development programmes from Initial Teacher Education (ITE) through to the Centre's online Masters module ‘The Holocaust in the Curriculum’. Her main responsibility is over-seeing the Centre's CPD offer 'Unpacking the Holocaust'. Before specialising in Holocaust education, Emma was Head of History in a school in Kent. Now working at the Centre for Holocaust Education, she teaches across all of the Centre’s professional development programmes and also works on the Centre’s Beacon School Programme for teachers leading their schools in Holocaust education; this programme involves teacher residentials in London and Poland. Prior to joining the Centre in 2010, she worked at Imperial War Museum London (IWM) and her last role was leading the Holocaust (formal) education provision. Working with both the IWM Holocaust Exhibition and Crimes Against Humanity exhibition in London, she developed and led sessions for school groups, ITE groups and members of the Police and Army. Her work at the museum also included updating the 2009 IWM publication Reflections and revising the student audio guides for the Holocaust Exhibition. Whilst at the Museum, Emma led the IWM Fellowship in Holocaust Education, a Masters-accredited international teacher development programme involving residential seminars in London and Jerusalem and site visits to Lithuania and Poland. During her time at the Museum she also contributed to the UK delegation to the International Holocaust Remembrance Alliance (IHRA). Over the years she has spoken at teacher seminars and conferences in England, The Netherlands, Hungary, Croatia and Greece. In addition to teaching, Emma writes classroom material for the Centre such as co-creating resources for an off-timetable enrichment day entitled Pursuit of justice: the trial of John Demjanjuk and the lesson Narrative links. Emma is currently working on a project with Imperial War Museum London to offer teaching resources on the 'Holocaust by Bullets' and with colleagues at Yad Vashem to develop the Centre's first MOOC 'Teaching the Holocaust: Innovative approaches to the challenges we face'. Having worked in teacher professional development for over a decade, Emma’s research interests focus on teachers’ experiences of professional development. Her thesis for her Doctor in Education degree (EdD) focussed on the experiences of women teachers pursuing professional learning whilst raising their families. Emma's work draws on life history methods, materialist feminism and Bourdieu's 'theory of practice'.